BRAC Community Empowerment Programmer (CEP) and The Hunger Project-Bangladesh (THP) is implementing a two-year partnership initiative to demonstrate that it’s cost-effective, replicable strategy successfully piloted in the previous years can be scaled up, and represents a viable national program for strengthening local governance as a means to fostering broad-based social and economic transformation of the rural countryside. More specifically, the project calls for strengthening Union Parshads for transparent, accountable and inclusive governance at the local level in order to accelerate the achievement of the MDGs. It will foster a partnership between the people, their elected local government representatives and, wherever possible, the government functionaries at the grassroots in order to help achieve the MDGs. It is also designed to engage in advocacy with the government for incorporating project learning and best practices into policies. The project output and outcome and the process of implementing it will be carefully documented and evaluated so that the bilateral and multilateral development partners could be approached in the future for funding for initiating a nationwide programmer. The project will be implemented in 14 Upazilas across 3 Divisions, 4 Districts and comprising 61 Unions. 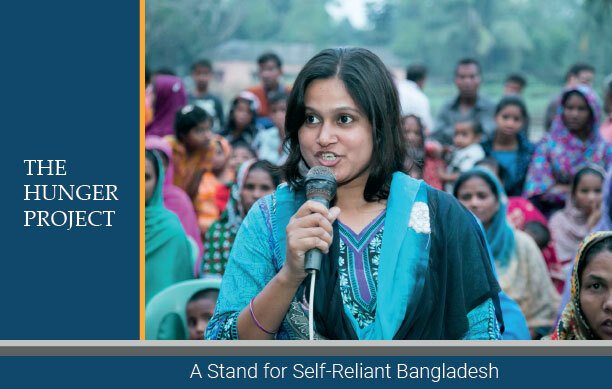 Over a two-year period of intensive mobilization and empowerment, it will demonstrate how an active citizenry including grassroots women leaders can work in partnership with union parishads to set local priorities, develop strategic plans to achieve them, and carry out mass-action campaigns to achieve solid, measurable development outcomes. Good local governance is key to ensuring sustainable local development. The recent UN High Level Panel has pointed out that local government is the vital bridge between government services and the people, and numerous studies have shown that people’s direct participation in local governance is key to effective local government. The constitution of Bangladesh envisions exactly this approach, and recent reforms mandate improved mechanisms for participatory democracy at the Union Parishad level. Yet these mechanisms have not fully been implemented. In the past three years in four unions, BRAC Community Empowerment Programmer (CEP) and The Hunger Project-Bangladesh (THP) have pioneered a social-mobilization approach to improve local governance, carry out participatory planning and achieve sustainable, self-reliant progress in ensuring local development including MDG outcomes. Based on the success of that pilot, this project proposes to scale it up to 61 union parishads (UPs) across 14 upazilas and demonstrate to the national government and other stakeholders how there could be larger expansion in the coming years. The goal of the project is to strengthen the Union Parishads in the target areas for transparent, accountable and inclusive governance in order to accelerate the achievement of the MDGs. To capacitate Union Parishads for carrying out their mandates defined by UP Act, 2009 and enhance their transparency, accountability and people’s participation in the delivery of public services especially to the poor and marginalized. To create a rural citizenry that holds UP to account and promotes MDGs. To engage in advocacy with relevant local and national level actors including policy makers for ensuring support from government in adopting project learning and institutionalizing best practices. build leadership both in local government and in grassroots civil society; In civil society, this includes training volunteer animators of both women and men, youth facilitators and women leaders who have more extensive knowledge of citizen rights, responsibilities and women’s legal rights. build an alliance of UP representatives – the Self-governing UP Advocacy Group – able to advocate for their own priorities at the UZ, District and National levels. These principles of social mobilization have been decisively utilized in Bangladesh and around the world on such goals as the promotion of ORT, family planning and vaccinations relevant to MDG 4. THP has demonstrated that they are equally effective in making progress in all the other MDGs.A key focus of BRAC’s strategy is to complement the government initiatives to achieve the national MDG targets particularly in areas facing socio-economic deprivation due to remoteness and inaccessibility where achievement of the national MDGs targets are much lower than the remaining parts of the country. Hence, the BRAC-THP partnership project will primarily focus on such areas including selected Haor and coastal areas of Bangladesh. This project is happening at a very important time – two years before the next UP elections, the two years after the soon-to-be held parliamentary elections, and the completion of the UN Post-2015 goals to replace the MDGs. Since governance is logically being proposed in all post 2015 development agenda drafts (e.g. UN & Bangladesh proposals), this project will be a good reference even in post MDG development endeavors. Coverage: 61 unions as shown in the table below, across 3 divisions,4 districts,14 upazilas.